Oven Barbecue Ribs are juicy, super flavorful and fall off the bone tender. Coated with easy to make dry rub first, then seasoned with barbeque sauce mixture, making them irresistible. 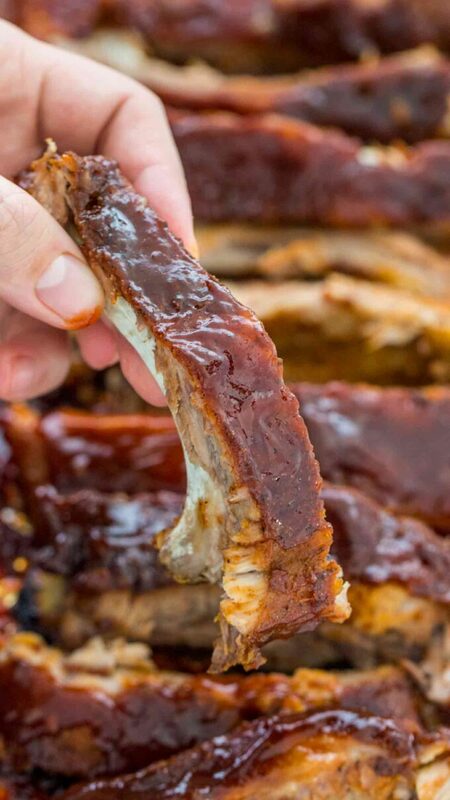 If you look for the perfect ribs recipe, look no further, this is as good as it gets! Watch step by step recipe video below. We love cooking them slowly, which makes them so flavorful and melt in your mouth. 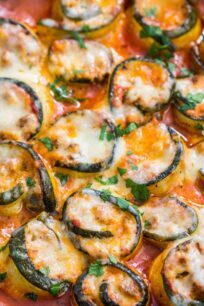 They are delicious just as but try mixing them up with Corn on the Cob or Crispy Roasted Rosemary Potatoes. 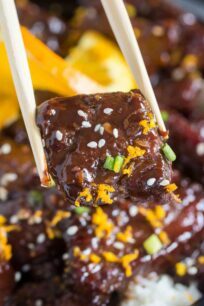 Oven Barbecue Ribs are probably one of the easiest homemade dishes you can make. Many people might have the impression that ribs are complicated to cook and require some skills to perfect them. But this is not true. With this recipe, you can see how simple and little work is required. All you need is 10 minutes of your time, the rest will be done by your oven. You can sit back and relax while the BBQ pork aromas fill your house. They turn out super juicy and incredibly flavorful. You can enjoy them to host a party, during game day, or simply on a regular day. They are welcomed at any time in our house! 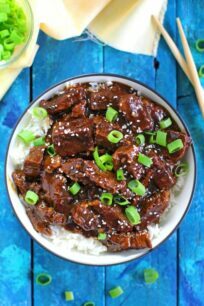 Similarly, if you are in a rush, you might want to try making them in the Instant Pot. You can find the recipe with video steps here. Do you remove the membrane off baby back ribs? As a general rule, we like to remove the thin membrane covering the rack. It is just easier to eat them without the membrane, and it can also be a bit tough when cooked with it on. Similarly, removing the skin off the rack will result in fall-off-the-bone meat, which is what we always love. How to remove the membrane off the rack? 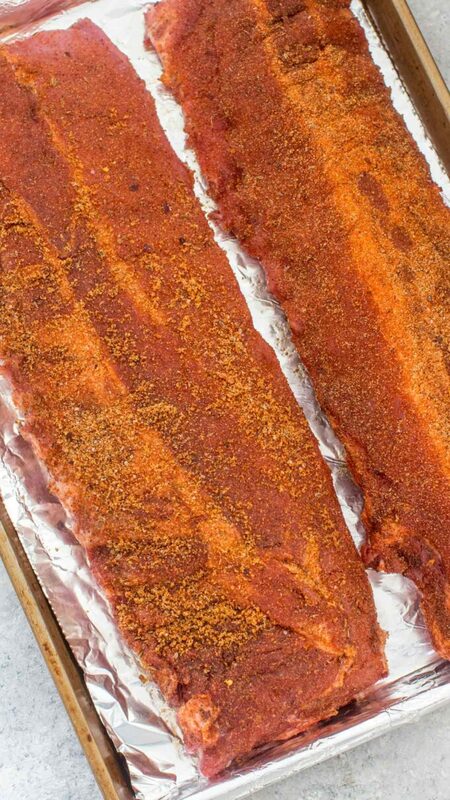 HOW TO MAKE THE DRY-RUB FOR THE RIBS? 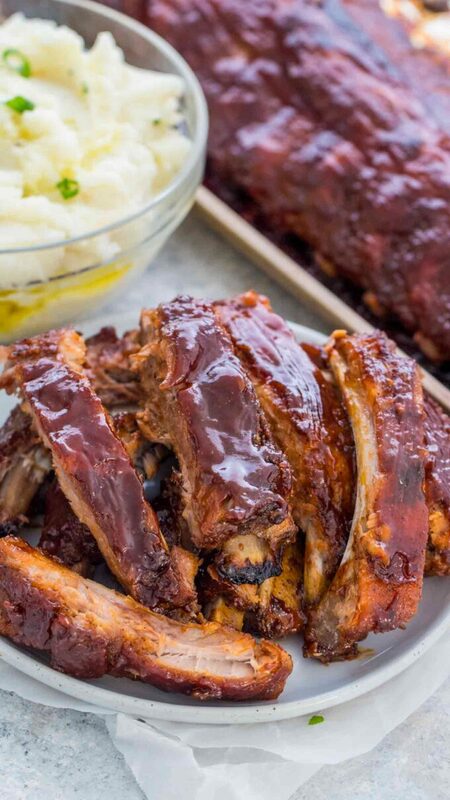 How to cook Oven Barbecue Ribs? Prepare ribs as mentioned above, by removing the membrane, then pat them dry with a sheet of paper towel. Season both sides of the ribs with the dry-rub mixture as per above instructions. Then place, meat-side up, into a large roasting pan. Cover tightly with aluminum foil, and then bake for about 2.5-3 hours, until very tender. Next, brush them with our homemade barbecue sauce mixture (see below). Lastly, broil for additional 3-5 minutes to get them a crispy and perfect brown color. While the ribs bake, make the barbecue sauce. 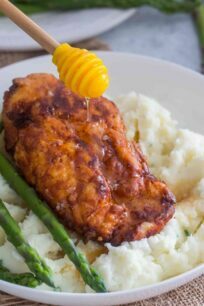 You can use store bought sauce, but we recommend trying this recipe, is finger licking good! Simply, add all the ingredients to a blender or food processor, and mix until smooth. Stir and set aside. It’s that easy. WHAT TO SERVE WITH Oven Barbecue Ribs? Oven Barbecue Ribs are juicy, super flavorful and fall off the bone tender. Coated with easy to make dry rub first, then seasoned with barbeque sauce mixture, making them irresistible. Preheat oven to 300°F (180°C). Remove the membrane that covers the back side of the ribs. Then pat them dry with a sheet of paper towel. Combine together the rub mixture, and mix together until combined. Season and rub both sides with the homemade dry-rub mixture. Place on a baking sheet (meat side up) or tray lined with foil. Cover the tray with foil and bake for about 2.5-3 hours, until very tender. During the last 5 minutes of cook time, mix together the barbeque sauce ingredients. Remove ribs from the oven, uncover the foil and brush them generously with the barbecue sauce mixture. Lastly, set the oven to broil, and bake them uncovered for an additional 5 to 10 minutes. My family loves barbecued ribs. We always use the outdoor grill during the summer but this recipe is perfect for when it’s too cold outside. 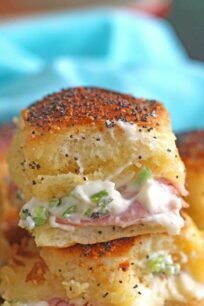 I need to make these for my Super Bowl party this weekend. For whatever reason I’ve never made my own ribs at home. 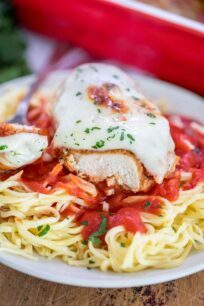 But this recipe and pictures really make me want to try! My mouth is watering! I love barbecued ribs anyway I can get them. I’ve always done them on the grill but I’m thinking that in the oven would be so good. I’m going to try this. I see a great game day meal in your future. 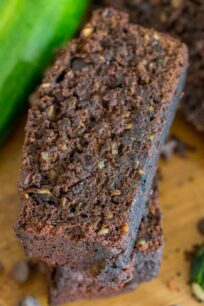 With the big game coming I know you will get a lot of parties fed with this recipe. I will be trying these for sure. I’ve been wanting some ribs but I’ve never tried to make them at home. They look incredible. Oh my gosh they look so delicious! I can just imagine my other half and I tucking down to a dinner of ribs. I’m going to have to add them to our menu! The oven seems like an ideal way to conquer ribs since it involves less work and all of the delicious flavor. I love that yours include both a dry rub and barbecue sauce too! I haven’t made homemade ribs at home in so long. I have to make sure I try this recipe when I do. YUM!! Ribs are my all time favourite meal so this is perfect! 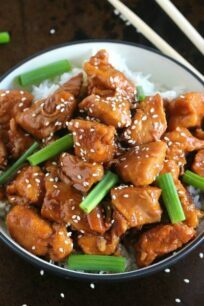 I am always interested to check out how other people do it and try new recipes. I;ll give it a go! 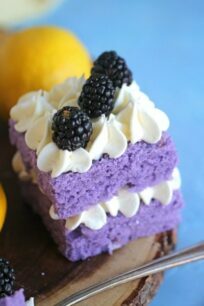 Those look really delicious! I’ve made ribs a few times, but I never knew about removing the membrane. I’ll remember that for the next time! I typically only make ribs in the summer, now I can make them in the oven in the winter. Thanks for the recipe!! This looks SO good! I love ribs, but have never really tried to cook these at home. Will have to try your recipe! I don’t eat meat anymore, but when I did, this was how I made my ribs. My husband LOVED them. Gosh these look so delicious for those who eat meat! I will pass this one along to my daughter who loves good BBQ! That looks good! I’ve only prepared grilled ribs. Saving your recipe because I’m definitely going to try this. Yum, these ribs are not on my diet but I sure wish they were. Looks utterly amazing. 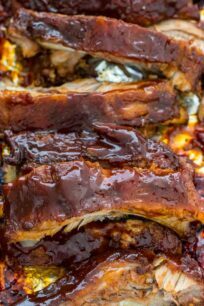 Love this oven barbecue ribs juicy and perfectly cooked, Those rub recipe is simple and ultimate recipe. Looking for a recipe for cooking ribs in the oven, came across yours and decided to give it a go. These were some tasty, fall off the bone ribs and the sauce was delicious ! I didn’t use the dill seed or sweet chili sauce as I was out, nor the red pepper flakes. Next time, I will dial down the spices just a tad (personal taste). 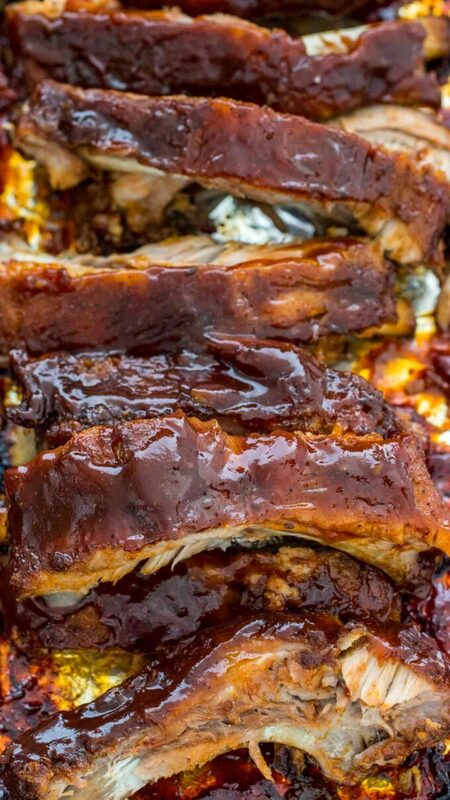 I have to tell you – my husband tore these ribs up and declared them delicious as soon as they hit his mouth !! That’s a win in my recipe book ! My husband loves these too!!! SO happy that you guys enjoyed the recipe!